The QuikDiSC card deck contains four color-coded groups of 32 cards each. Each group has four sets of eight words that describe D, i, S, or C behavioral dimensions. Instructions for playing the game and suggestions for debriefing are included. Also included are six applications for specific training situations. The QuikDiSC cards are very flexible and many facilitators find creative ways to use them. Here are a few training suggestions that are variations or aren’t included in the card deck. First, familiarize yourself with the cards and be prepared to provide definitions of words, if necessary. For groups of ten or more, with participants sitting at at least two tables. Requires one box of cards for every 5 participants. Shuffle the cards and distribute six cards to each participant. Ask everyone to select one of their cards that is least like them and place it face down on a table in an open area. Explain that they are keeping the five cards that they feel are most closely—but perhaps not completely accurately—reflect how they see themselves. Ask everyone to return to their seats and select the two cards in their hand that feel most like them. The other four cards should be placed face up on a table where people can take from them to build a new hand that better reflects their personality. Ask each participant to share one of the cards in their hand and offer an example of one potential strength of this behavior and one potential weakness. Note: If a participate is dealt more than one copy of the same card, replace the duplicate with another card from the deck. This exercise will help participants, practice receiving feedback without comment, see the value of all styles, and show their appreciation of other styles. Participants should already know each other. 2. Place piles into hats or buckets so every four or five people have a set of cards to draw from. 3. Ask each group to go around their circle taking turns pulling a card out of the hat and placing it in front of the person they think best matches the characteristic on the card. Ask that recipients not respond or only say “thank you” when they receive a card. 4. 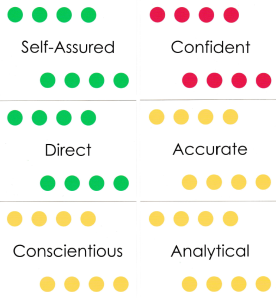 After cards are distributed, allow a short time for participants to discuss how well these match or don’t match self-perceptions and perceptions of others in the group. 5. Ask each person to exchange a card with another based on a characteristic they’d like more or less of. So Ava might feel that she overuses or relies too much on being self-assured. She might describe a time this blinded her to a problem or kept her from sufficiently preparing for a presentation. She asks Aaron to swap for his generous card. If the group has high trust, you can also ask participants to go around the circle and choose a characteristic they’d like each person could stretch themselves to express more often. 6. Some groups might want to discard cards that don’t seem to fit any of them. If they do this, have them discuss what this absence might mean if they were to work together on a project. End the exercise by revealing which colors represent each style and how many people had more than one color in front of them. Why might that be? (We’re all a blend of all four styles. We might express one style more than another when in this group. A group might be missing a style so the person who simply displays it most got the card. It’s dangerous to pigeon-hole someone based on only know their style.) How did it feel to accept the cards given to them and not make a comment? How is feedback normally given and received in their group? How can the group help each other strengthen the expression of the characteristic they chose in step 5? For groups separated into tables of three to seven people who regularly work together on projects. Each person is asked to identify how each of their strengths (reflected on their cards) has contributed to the success of the team. Ask for someone at each table to remove all the discarded cards on their table. (These are the cards previously rejected by participants.) Then deal out three of those cards. How could these three traits be helpful on your team? How will you facilitate their expression on your team? Ask everyone to share the card they chose and offer an example of when or how this behavior could contribute to more success, effectiveness or cohesion on their team. Shuffle the QuikDiSC cards and give each person five or six cards. Ask each person to select a card that reflects a trait they feel their team could use more of, or could use more productively. Shuffle the QuikDiSC cards and give each person six cards. Several extra cards can go face-up on their tables. Ask each person to select one card from their hand or table that reflects a strength they bring to their team. 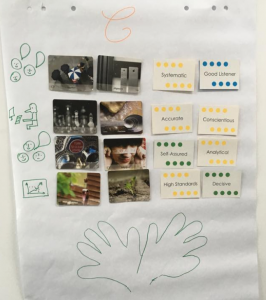 Participants should share their selected card and offer an example of when they used this behavior to support their team. Ask each person to select a card from their hand or table that reflects a strength the person to their left brings to their team. They should then share the card and an example of when that person exhibited that strength with the team. Have each team or table select an upcoming or just-initiated project for which they are responsible. Give them time to talk about a few of the challenges they expect to encounter. Place at least a dozen cards at each table. Ask participants to select four or five cards that reflect behaviors they’ll need to make progress on their project. Ask everyone to discuss how they can support each other to reflect each of these behaviors. If “fact-finder” was selected for example, and only one of you is naturally inclined to this behavior, is fact-finding the default responsibility of that one person? 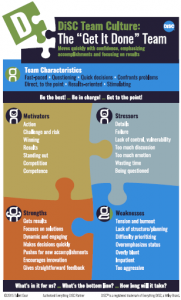 Note: These team culture posters can be helpful and fun to post after these exercises. Ask everyone to share their “enjoy” pile and how they would attempt to motivate (develop or direct) a person with these characteristics. Others at the table can add their suggestions after the person is finished. Now do the same for the “challenge” characteristics. Allow people to refer to their profiles for help coming up with motivation strategies once they have completed the exercise. For smaller groups that have worked together and know each other. Ask everyone to keep the cards they selected during the game as most like them. Place them upright and turned towards the others at their table so they are easily read. Ask each person to look at the cards and share an example of why they appreciate it in their colleague. If there is time, each person can go around and appreciate everyone at their table. If not, each person can appreciate the person to their left. Encourage participants to give concrete examples of when or how they’ve observed the trait they chose to appreciate. Do you have any favorite activities to share? Our team at DiSCProfile.com used these cards for team-building. We are all very familiar with DiSC and each other’s styles. However, the restriction on the number of cards you have in your hand and the words chosen made the game play out more productively than we expected. We did not all choose the cards that matched our styles. In other words, the i-style did not pick all red cards. We were able to see where we find it easier to flex into other styles at work. To build up trust on our team, we also shared personal stories to illustrate the cards we chose as the personality traits most challenging for us (either to express or to encounter).